Not only did Mitch McGary help the Michigan Wolverines reach the Final Four for the first time since 1993 (and inspire articles like this in the process), but his play during the last few weeks of his freshman season left him with an extremely interesting decision about whether he should declare for the NBA Draft. If you had a pulse during the month of March, you know that McGary went from a complete afterthought behind guys like Trey Burke, Tim Hardaway Jr., Glen Robinson III, and Nik Stauskas during the regular season, to one of the driving forces behind Michigan’s run through the NCAA Tournament. Those who watched McGary play during the regular season saw a kid who had a ton of potential based on his size and combination of skill/hustle, but one who looked like he was going to have to wait until next season for his official coming out party to commence. 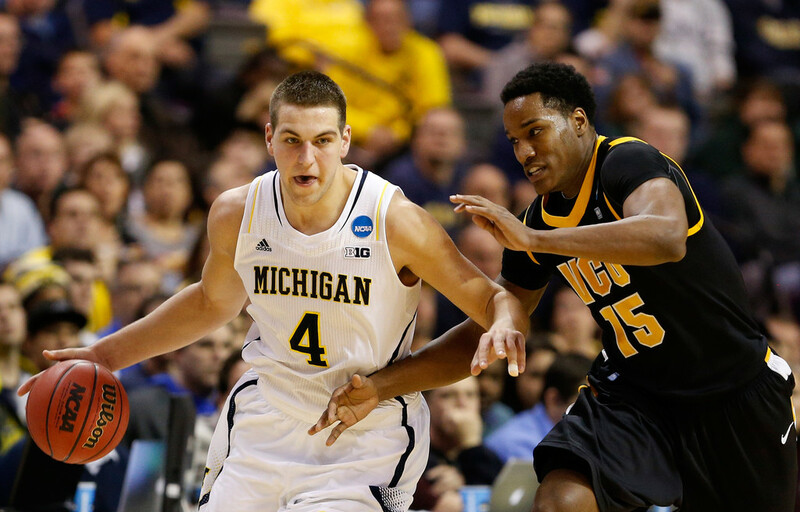 Of course, after the 6’10’’ Indiana native averaged 14.3 points and 10.6 rebounds per game going up against teams like VCU, Kansas, Syracuse, Florida, and Louisville in the tournament, it was clear that McGary wasn’t content to wait for his sophomore season to announce his presence. Furthermore, for a guy his size, such a performance meant that NBA Draft rumors would surface regardless of whether or not McGary was ready for the draft (or if going pro was even on his mind). “McGary Mania” reached its peak after he played a key role in helping Michigan bust Syracuse’s zone with a 10 point, 12 rebound, 6 assist performance in the Final Four. After that game, there were reports from “scouts” and “people in the know” speculating that another good performance against Louisville in the National Championship game could propel McGary into the top 10 in this June’s NBA Draft. As we all know, McGary struggled with foul trouble against Louisville, and Gorgui Dieng (a first-round pick in his own right) held him to a modest six points and six rebounds in what was an anticlimactic finale compared to McGary’s otherwise dazzling tournament play. Even though McGary didn’t play his best when matched up against another NBA-caliber big man in Dieng, his overall body of work in the tournament combined with his size/athleticism/hustle and the relatively weak 2013 draft class had Chad Ford (and others) projecting Mitch as a mid-first round pick about two months away from draft day. That was until the news broke yesterday that McGary, along with fellow freshman Glen Robinson III, would be returning to Michigan for their sophomore seasons. There’s little doubt that McGary will benefit from another season in Ann Arbor where he will now have the chance to improve his post game and horrendous free throw shooting (44% during his freshman season). He will also have the opportunity to be one of the best players in college basketball while helping Michigan tend to their “unfinished business”. At the same time, there was a compelling list of reasons why he should have bolted for the NBA as well. McGary’s stock had risen exponentially in the past two months, and regardless of how he plays next season it seems highly unlikely that his stock could be any higher than it is right now. In fact, the only thing that McGary might do by coming back to school is hurt his stock by not performing up to whatever set of expectations will be concocted for him next season. We’ve seen it happen before with NBA prospects who decide to come back for another season, and it’s entirely possible that scouts could begin to pick apart McGary’s game now that he’s going to be under the microscope every time he takes the floor. And of course, there’s always the chance that an injury or “injury concerns” could cause McGary’s draft stock to plummet (ask Jared Sullinger about that). Even assuming that doesn’t happen and the scouts find something better to occupy their time, when you throw in the fact that the 2014 draft class figures to be much stronger than the 2013 class, it’s even conceivable that McGary could have a fantastic sophomore season at Michigan and live up to expectations, but see his draft stock falter because of how much talent exists in the 2014 class (I’m pretty sure Kentucky alone will have something like six lottery picks on their roster next season). Then there’s the matter of Trey Burke departing for the NBA. Burke was one of the most dynamic players in the country this past season, and his ability to breakdown a defense and find his teammates for open looks made things easier on everyone he played with. McGary was no exception. Players like Burke only come around every so often at the collegiate level, and with all due respect to Spike Albrecht, McGary won’t have the luxury of playing with an NBA-caliber point guard next season in Ann Arbor. At the same time, I don’t have much doubt that McGary’s size, athleticism, rebounding, and hustle should translate at the NBA level (those skills usually do), and if he decided to go pro, McGary, like most rookies, wouldn’t have gotten much playing time his rookie season. Leading to the old axiom: no player improves his game when he’s sitting on the bench. It’s crazy to think that a guy who wasn’t even the second most noteworthy freshman on his own team during the regular season (however you want to award the 1/2 distinctions between Stauskas and GR3 is fine with me) and one who played behind Jordan “you really don’t want me shooting the ball under any circumstances” Morgan for much of the year, suddenly played himself into NBA Draft consideration on the heels of a few strong performances when the college basketball lights were the brightest. But that’s exactly what McGary did about a month ago. Speaking selfishly as a college basketball fan, I’m ecstatic that Big Mitch is coming back to school because I'd much rather see McGary terrorizing the Big 10 next season than getting terrorized by Glen Davis about a peanut butter and jelly sandwich (or even worse, Delonte West), but it wouldn’t have been the first time a young player parlayed a fantastic performance in the tournament into NBA riches. Of course, McGary clearly wasn’t worried about his draft stock and now he’ll get the chance to polish his game and represent the University of Michigan for another season. The ironic thing about McGary coming back to school is that he will undoubtedly be more prepared for life in the NBA at this time next year, while most likely watching his draft stock take a hit. Not that this equation makes very much sense, but as we’ve all seen in the past, declaring for the NBA Draft might not be so much about when you’re ready for the NBA, as it is when the NBA is ready for you.